This inviting home has craftsman styling with an abundance of upscale features. 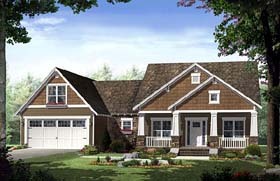 The front and rear covered porches add great spaces for outdoor entertainment and relaxation. The great room features a vaulted ceiling, and the well-equipped kitchen has a large island with an eating bar. The hall bath is equipped with dual lavatories for convenience. The master bedroom has a raised ceiling and opens into the well equipped bath with dual lavatories, corner tub and walk in closet. There is a shop area off the garage for projects and storage. The flex space provides a great space for that home office that you've always wanted. This is a very flexible home with lots of options to suit your family's needs. Question: From a previous question you answered that the s.f. total for heated was 1619 but doesn't include wall thickness. Does that mean the final plan when bought will have a greater s.f. number? Answer: Hello, The square footage DOES include wall thickness. What I said was that the room sizes do not include wall thickness. Those two items are not related. The online image is a presentation image, intended to be easy for people to see how much usable space exists inside each room. Those figures are not used when we calculate footage by another method. The heated footage of 1619 s.f. exactly matches the footages as listed on the prints. This plan has 1619 s.f. heated, 1030 s.f. unheated, total under roof footage is 2649 s.f. Thanks. 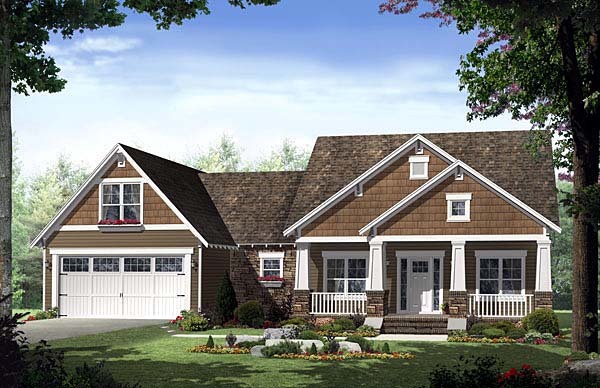 Question: This plan 55600, the interior seems larger than what it says, is it correct? Just over 1600 square feet? Answer: Yes, the footage is exactly 1619 s.f. heated, 1030 s.f. unheated, for a total of 2649 s.f. under roof. The room sizes show the actual useable space inside each room, and do NOT include wall thicknesses. Thanks. Question: How wide is the entrance into hallway leading to the 2 bedrooms? Answer: Hello, The opening is labeled 32" width, but we recommend widening it to 36" or 42". We also recommend shifting it to the rear right corner of the great room to allow a space for the television in the center of the room, which is also the peak of the vaulted ceiling. Shifting and enlarging that opening is easily done onsite. Thanks. Question: My husband and I love this plan, but the lot we have will only accommodate a 50' wide home, due to placement of septic field. Can this plan be modified to a 50' depth? Answer: Hello, Your request asks for a 50' wide home, then also says 50' depth..... If you need 50x50, you need to find another plan. If you need 50' width, and the existing 52' depth is acceptable, you would need to find another plan. If you need 50' DEPTH, and the existing width of 64' is acceptable, then we could modify the plan to fit that footprint.. We would shift the garage back two feet into the laundry/storage area, and widen the laundry room by taking in some of the storage, so that the washer and dryer can be along the front wall.. So the laundry would be approx. 6'x10' with a sink/counter as is, and the washer/dryer side by side to the left of the existing counter. The storage room would be 6'x7'. The existing garage allows 23'-8" depth, and thats needed for full size vehicles which are approx. 20 feet long.. so we recommend keeping that depth as is... and reduce/resize the laundry.. The modification fee would be $425 in addition to the purchase of the plan package. When you are ready to proceed, please call the website to place your order for the plan package. Be sure to tell them that you are having modifications done by the designer. They will process the order, and send a copy to us. We will then proceed with preliminary plans for your review. We would request payment when we have completed the final plans. Allow 3 to 5 working days for preliminary plans, and another 6 to 10 working days for final plans. Timelines change with our workload, and may vary depending on when you decide to proceed. We are closed from Dec. 23rd through Jan. 1st, so those are not considered working days for us. We look forward to working with you. PS- Customized materials list are not a part of this quote. If you purchase the online materials list, it will match the ORIGINAL plans. We do not offer customized materials lists at this time. Local builders and carpenters are the best source for those. Thanks. Question: Does it require a plan modification for the back porch to be screened and also can a gas log fireplace be added to the great room? Thanks. Answer: These changes can be made on site with your builder. Answer: Hello, Yes, that can be done. See plan 59148 for what it would turn out to be like. This is an 1800 s.f. version of the same plan with a bonus room already added. Perhaps you would prefer this plan instead. If you prefer to modify the smaller plan, just let me know, and we can provide a modification quote. Thanks. Question: How big is the attic in this house and where is the access to it located? Answer: Hello, There is an attic over the garage and master suite, which would allow a room about 12 feet wide, the full length of that side, with five foot tall sidewalls, sloped ceilings on each side, and a flat 8 or 9 foot ceiling in the middle. There is also a bit of space over the kitchen area, maybe 5 or 6 feet wide, or useable space. The great room vaulted ceiling eliminates that attic, and there is an area maybe 12x14 size (5 feet high or taller) over the hall bath at that end. No good way to access that side though, except a pull down stairs in the hall . There is a pull down stairs located in the garage. Question: Email: abcknox416@gmail.com Plan Number: 55600 Question: Can this floor plan be modified to have a basement ? Answer: See plan 55603 for the basement version. Thanks. Answer: Good morning, The bedroom doors are all 32 inches wide which is wheelchair accessible. The laundry room door is 36”, The side garage door is 36, The door on the toilet room in the master is 26” but there is room to make it at 28”, the master bath and closet are 32”, Flex space is 32, but could be 36, and the bath #2 is 26. The double door on the rear great room wall is 60”. Hope this helps you. If you need any of them larger, we can modify the plans to accommodate your needs. Just let us know. Have a great day and God bless! Question: Hi. I emailed earlier to ask about basement foundation option with this plan. I understand it is in the works. My next Question is the basement under the whole house or partial ? If partial, what section of house is it underneath? Answer: The basement will follow the perimeter of the heated and cooled area of the house. The porches and garage and storage would be concrete, with no basement under them. The rear porch could be designed as wood floor, so you could use the basement level under the rear porch another covered porch. Most people like to put doors and a window under there, if it is a walkout basement. Question: 2 questions please: what is the total under roof square footage? what are the dimensions of bath 2 please? Thanks! Answer: Good evening, The total under roof footage is 2649- that is 1619 heated, studwall to studwall, and 1030 unheated- porches and garage. The bath 2 is 8’ wide and 7’-6” deep. Hope this helps. Have a great evening and God bless! Question: Please advise the energy savings features of this house, ie., ridge vents, insulation, type of windows, etc..
Answer: Good afternoon, Energy features can be added to any house you want. I recommend the foam insulation in the walls and attic. You can upgrade the plan to 2x6 exterior stud walls if you like. That would just allow for more insulation in the walls. The best money you can spend is to buy some energy efficient windows. The gas filled, low “E” , specialty windows and doors are the best investment you can make. Speak with your local supplier about your cost and options on that. Purchase only energy star certified appliances and use the tankless design “on demand” type water heater. Also purchase the highest efficiency heat and ac unit you can afford. They are rated in “ Seer” The higher the seer number, the better, Typical units are 12 Seer, so you may want one rated higher than that, but price goes up quickly, so you will need to look at budget as well. You can also purchase energy efficient light fixtures and bulbs which will help. Have a great day and God bless! Click Here to download a free PDF Brouchure of Plan Number 55600.